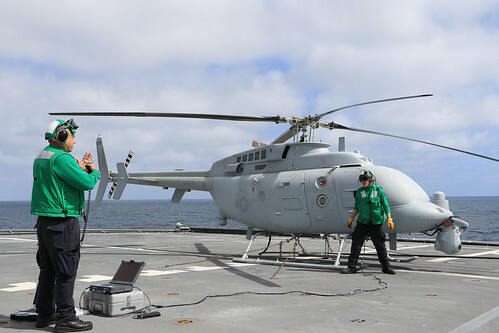 SAN DIEGO - USS Coronado (LCS 4) and Air Test and Evaluation Squadron (VX) 1 completed the first comprehensive Initial Operational Test and Evaluation (IOT&E) for the MQ-8C Fire Scout, June 29. 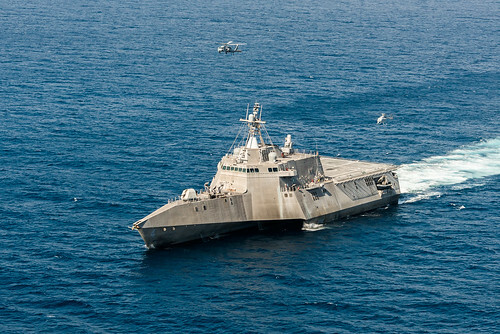 Results from this IOT&E will inform decision-makers on how best to integrate the Navy's newest unmanned helicopter with littoral combat ships (LCS) and other platforms. "The results, lessons learned, and recommendations reported on following this underway test period are absolutely invaluable to the future of the MQ-8C Fire Scout's mission effectiveness and suitability to perform that mission," said Lt. Cmdr. Seth Ervin, the lead for the VX-1 detachment aboard Coronado. Coronado and VX-1 conducted simulated engagements to evaluate Fire Scout's role in target identification, intelligence gathering and surface warfare operations. The testing also focused on developing practices for simultaneously operating and maintaining both the MQ-8C Fire Scout and the MH-60S Sea Hawk. Results confirmed that while it requires extensive planning and coordination across the ship, simultaneous operations can be conducted. "It has been challenging and rewarding to be one of the first maintainers afforded the opportunity to take both aircraft aboard the ship. Working together, we made the overall product more functional and efficient for the fleet," said Aviation Machinist's Mate 2nd Class Salvatore Greene, a member of VX-1. The chance to contribute to technological and tactical improvements within the LCS community creates a notable opportunity for Coronado's experienced crew. "My crew is excited to build upon their past experiences operating with Fire Scout and continue to improve our proficiency as a war-fighting team," said Cmdr. Lawrence Repass, the commanding officer of Coronado.